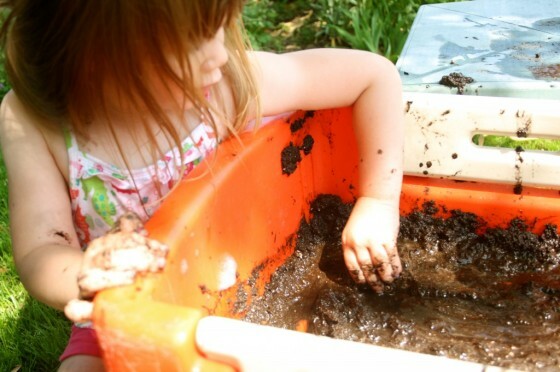 Who’s ready for an awesome mud play idea? 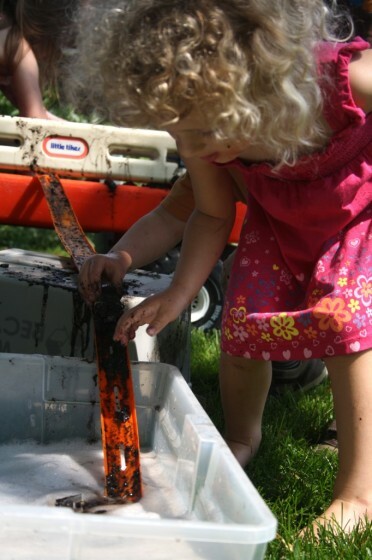 A muddy car wash is a terrific mud activity for preschoolers! 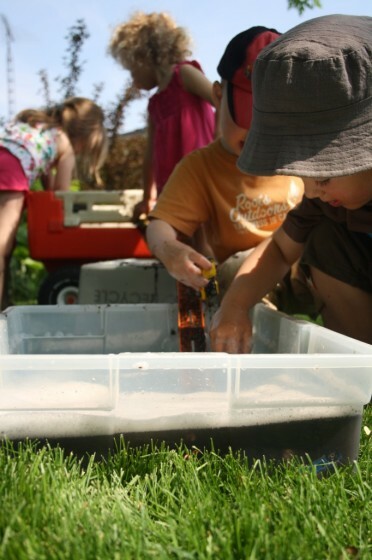 Drive those cars through the mud, down the ramp, and “splash” into a bucket of soapy water! 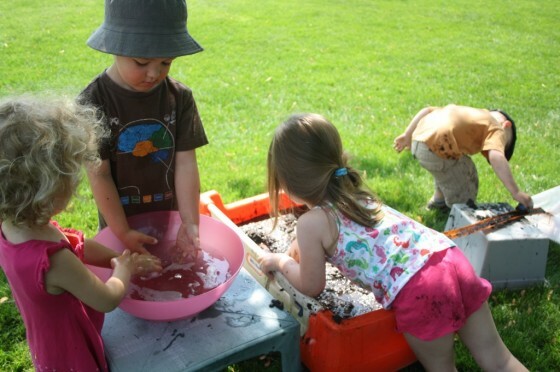 Oh, we’re loving our water play activities and all of our mud play now that the summer weather has arrived. 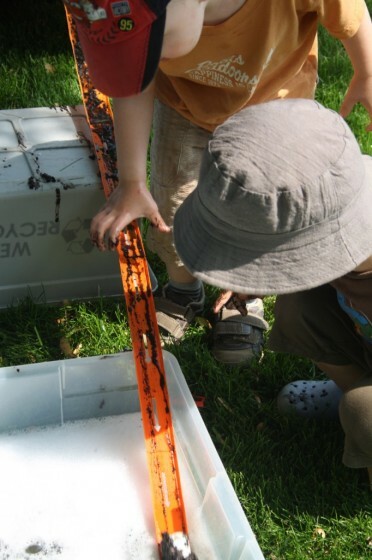 Our latest favourite combination of the two is this awesome muddy car wash! It’s a really simple and fun outdoor activity for toddlers and preschoolers! 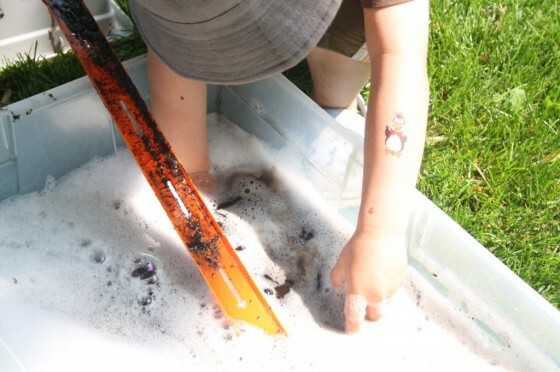 The hooligans loved driving their toy cars through mud, racing them down a track and landing in a basin of soapy water! They were at it for ages this morning! 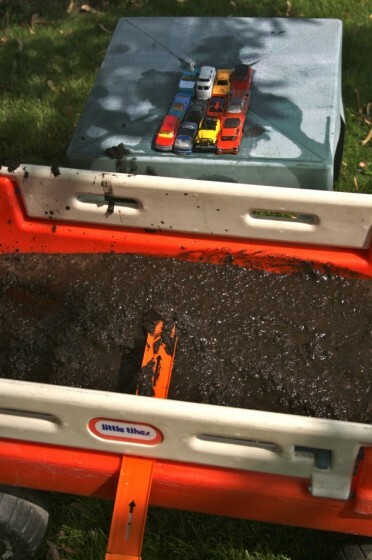 I turned our wagon into a mud pit by mixing up some potting soil, several scoops of sandbox sand, and a bucketful of water. If you’ve been following along with us, you’ll know I often transform our wheelbarrow into a mobile mud pit for the kids to play in! Then several feet below and away from the wagon, I placed a large basin filled with soapy water. What kid doesn’t LOVE playing in a bucket of water! I ran our Hot Wheels Tracks from one to the other. I set some cars up at the mud-pit and called the gang over. You can probably guess how popular this activity was. They LOVED it! The basin of water didn’t stay clean for long, but that made things even more fun; they had to search around in the black water to find their cars, and the cars didn’t exactly zoom down the track with all that mud either, but the Hooligans didn’t even seem to notice. They were happy to push them along until they reached their destination. 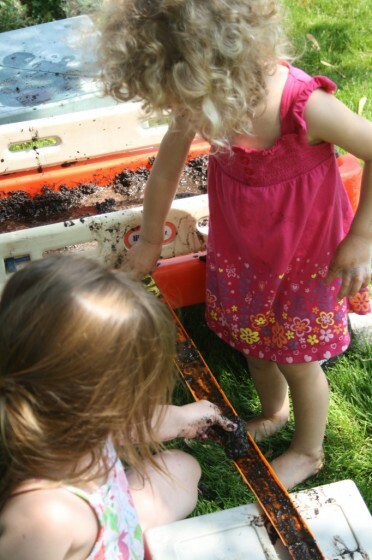 Now, be prepared: your little one COULD get very dirty. I’m not saying he or she will. In fact, a couple of the Hooligans stayed quite clean. Even Miss Mess wasn’t too bad, although I did give her clothes a soapy rinse before sending them home. Yup sure, little guy. Whatever you say! 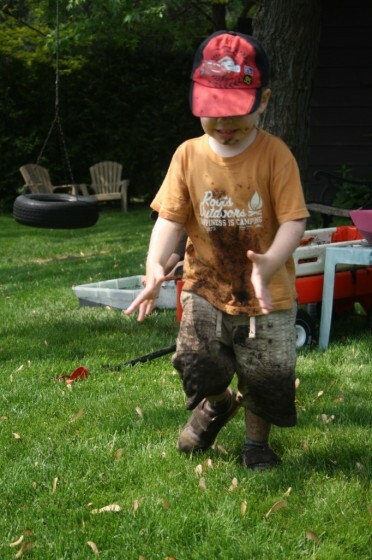 I feel I need to share this next photo for those of you who might be horrified by the state of his clothing. 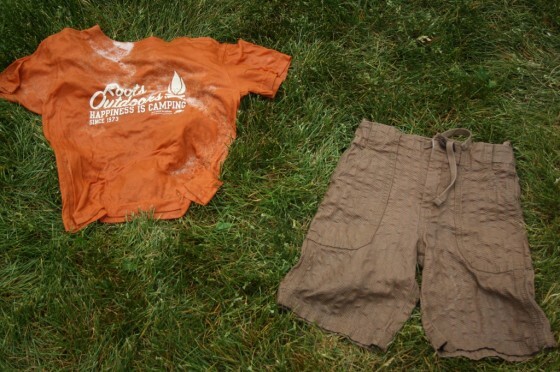 I tossed them onto the grass (the clothes, not the kids), sprinkled them with some dish soap, and gave them a blast with the garden hose. In less than a minute, they looked like this. See…. 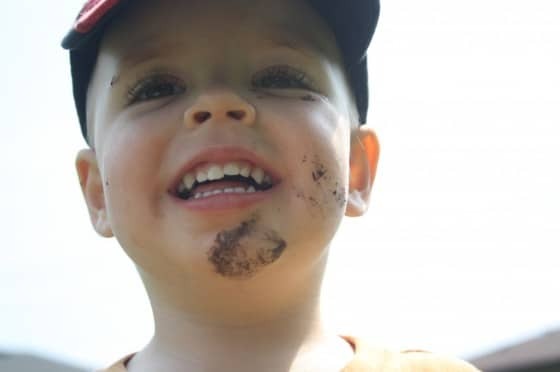 don’t let a little dirt scare ya! 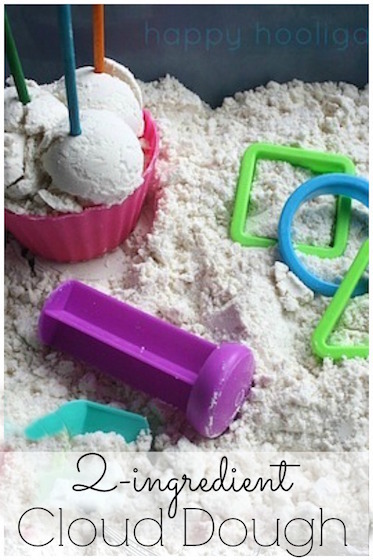 Let them get messy! They’ll love you for it! 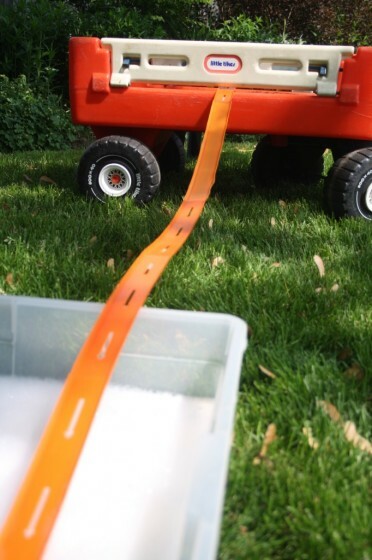 And of course, if you’re looking for a cleaner-but-still-messy alternative to this activity you can always do this version of a car-wash.
Are you kidding me???!! This is brilliant!! 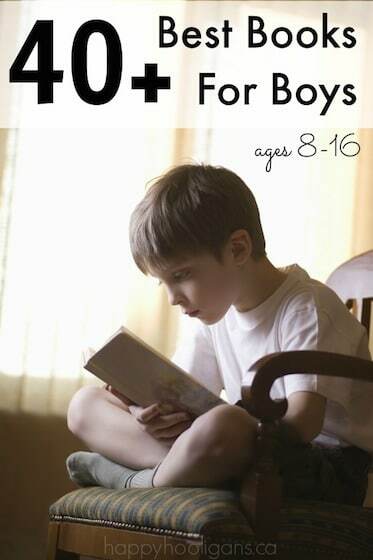 Ooooooo…I can’t wait to do this with the boys next week! Jackie, my son will be forever grateful to you! 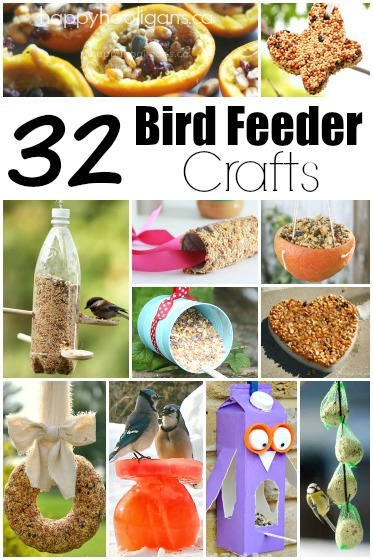 Thank you for sharing such a fabulous activity! Woot!! Thanks Arlee! Hope your guys have as much fun as the Hooligans did! Yup, it’s a pretty popular combo with the kiddos, isn’t it?! Have a blast with yours, Danielle! I think I should be brave and give this a go! The clean clothes at the end of your post may have convinced me, that and the thought of some very happy boys! What did you use as the track? Did you buy one or use some sort of household product? My 2 preschoolers LOVE their hot wheels cars so this will be a big hit once warm weather arrives! 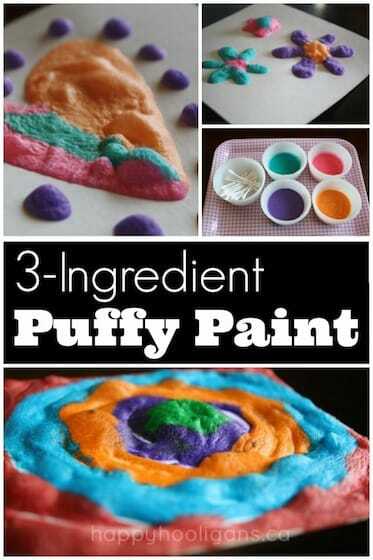 Can’t wait to surprise them with this fun activity! Thank you! This was so much fun! 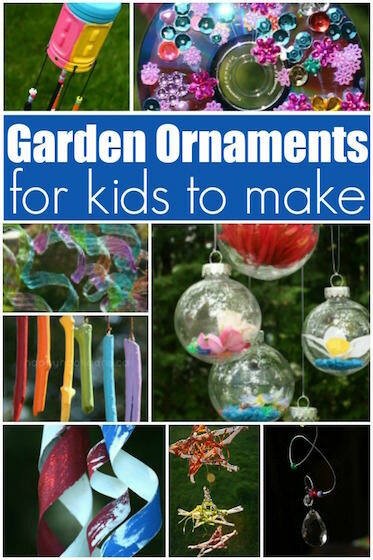 We did it at my house yesterday and the kids had a blast. Surprisingly, they weren’t into the mud. I was expecting they would love it but they really loved racing the cars on the track and plunking them into the water. Thank you for the great idea! Awesome! I’m glad they had so much fun with it. This one is a favourite here!